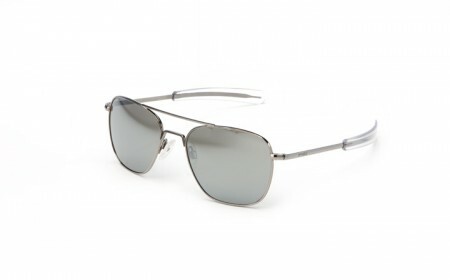 There are countless aviator styles out there, but only one Randolph Engineering. Built for the U.S. Military, the RE Aviator surpassed their rigid specifications standards. Since then, the Aviator has become our flagship product and has set the standard for our world-class quality. These sunglasses are the epitome of serious equipment. From their unique bayonet temples that are designed to fit comfortably under headgear, to the lifetime warranted solder joints, you can always rely on the Aviator to perform... especially when you need it. This style is also available as a prescription frame with optional sunglass clip-ons. The Aviator is the first of many Randolph Engineering sunglasses that are worn by those who demand the best. When NASA Astronauts lift off the launch pad, or when America’s top gun pilots step into the cockpit, Randolph Engineering provides the priceless pair of sunglasses that helps them safely navigate the skies. Before ordering an RE product, contact customer service, whether your choosen product is stil available! Please indicate in "Note" the details of the sunglasses: lens size, lens style, frame! All Randolph Engineering products have been meticulously handcrafted for over 35 years. Utilizing only the finest materials, our craftsmen and women create some of the world’s best eyewear. Over the years, Randolph Engineering has retained an integrated manufacturing approach with the end benefit being a level of American made quality, craftsmanship, and comfort unequaled in the industry. Whether you’re piloting an F18 fighter jet or driving a car, you need the best lenses available to protect your eyes and enhance your vision. When it comes to superior quality lenses, Randolph Engineering has you covered. All of our lenses absorb 98-100% of harmful ultraviolet rays and allow a range of 12-18% of visible light to pass through; the ideal comfort level for most wearers. Our mineral glass lenses are exceptionally scratch-resistant, and will provide you with absolute distortion-free clarity. They’re also precision ground and chemically tempered for impact resistance that exceeds ANSI Z-803 standards. From any shooting discipline to fishing and hunting, quality lenses will not only protect your eyes from numerous hazards, they’ll actually elevate your performance and prevent your eyes from becoming fatigued. Those who are serious about the quality of their vision depend on Ranger lenses to perform, no matter the goal. Although all Ranger lenses absorb 100% of UV rays and are molded at above industry standard thickness for your protection, the best advantages to wearing our lenses are enhanced definition and optical clarity. Unlike other shooting lenses, Rangers are made with distortion-free optical-grade polycarbonate. This gives you the level of protection you need while not compromising the quality of your vision.